Drager X-am 7000 is the innovative solution for the simultaneous and continuous detection of up to five gases. A combination of more than 25 sensors allows flexible solutions to individual monitoring tasks. The Drager X-am 7000 can be equipped with three electrochemical, and two catalytic bead, infrared or photoionisation sensors. It is the ideal companion in a great number of applications where reliable monitoring of Oxygen, toxic and combustibles gases and vapors in the ambient air is necessary. The extensive portfolio of over 25 different DragerSensors allows the detection of more than 100 gases and vapors. The measuring range of the EC, Cat-Ex, IR and PID sensors can be changed to another gas within a list of gases by a push of a button - without the necessity of re-calibrating. In this way the instrument can be adapted easily to various applications. DragerSensors are renowned for fast response, minor cross sensitivities, high accuracy and long life. Each sensor is recognized automatically by the instrument. All sensors are pre-calibrated, and a reconfiguration of the Drager X-am 7000 is done by simply changing a sensor. I.e. no additional service or maintenance is necessary. The software menu of the Drager X-am 7000 was designed in partnership with our customers making it simple and easy to use. Functions such as TWA and STEL values, as well as functions, like peak hold can be viewed or switched on quickly and with minimal training. Searching a leak has been revolutionized by the Drager X-am 7000. In the trackingmode, the instrument generates an increasing or decreasing rate of beeps, depending on the gas concentration detected. Additional to the built-in dust and splash water protection, the Drager X-am 7000 can be submersed without damage. A specially designed rubber-boot protects the instrument against damage from a drop of 1.5 m (5 ft.). NThe completely new design of the rechargeable battery block with intelligent charging management guarantees full functionality of the instrument over a period of up to 20 hours (depending on the battery type). An alcaline battery pack is also available. The DragerSensors used in the Drager X-am 7000 have a typical life of over 5 years. If, in time, an exchange is necessary, the modular approach of the instrument allows this in a few simple steps. Alarm conditions can not be ignored because of the sound of an extremely loud multi-tone horn. In addition the visual alarm can be seen through 360° ensuring it attracts the users attention. 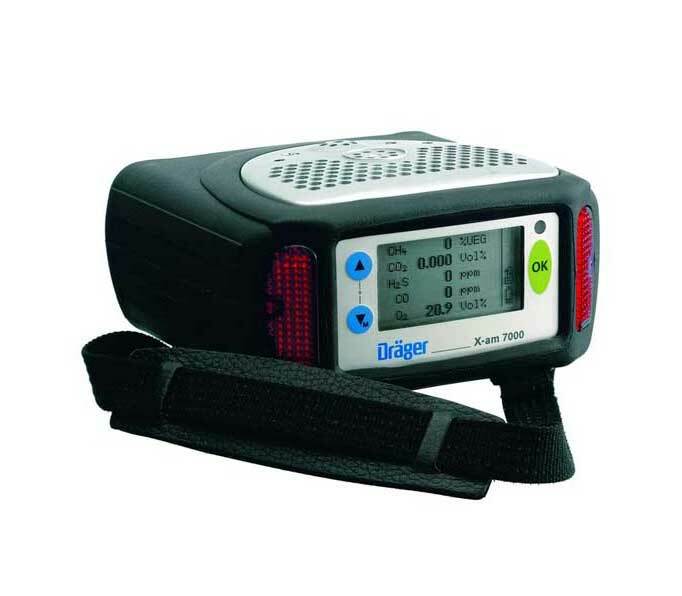 By generating a life-signal every six seconds the Drager X-am 7000 confirms it is functioning normally. The large graphic Display and the alarm autozoom function guarantee easy recognition of the values and symbols displayed for immediate judgement about the situation or hazards. All information is provided in plain text. A built-in data memory logs up to 3000 sets of values - that is data logging of 100 hours when recording one set per minute. The data can be transmitted and evaluated on a PC using an infrared interface together with the Drager GasVision software package. The built-in high power pump allows to sample gas through an up to 45 m/150 ft. long tube. The operation of the pump is continuously monitored, and the instrument will generate an alarm if the flow is too low.